The Best Indian Lifestyle blogs from thousands of Lifestyle bloggers in our index using search and social metrics. Data will be refreshed once a week. Indian Lifestyle newsletter is a comprehensive summary of the day's most important blog posts and news articles from the best Indian Lifestyle websites on the web, and delivered to your email inbox each morning. To subscribe, simply provide us with your email address. Mumbai About Blog India's premier and only home-grown luxury and lifestyle monthly. Arts & Culture, People, Fashion, Style, Beauty, Travel & Food. Facebook fans 314,673. Twitter followers 30,690. Bangalore , India About Blog StylishByNature is a Fashion/Lifestyle website for all like-minded people who believe that style runs in their blood and is as important as breathing. Look forward to more on fashion, food, fitness, fun, friends and flavors of life. Facebook fans 180,051. Twitter followers 12,605. Facebook fans 40,906. Twitter followers 9,769. India About Blog Tips Clear One stop solution for Beauty, Fashion, Health, Travel, Skin Care, Shopping, Business, Technology Issues. Facebook fans 20,899. Twitter followers 7,029. Kolkata, India About Blog I will like to share my experiences and invite parents to share theirs as they grow up with their kids. Facebook fans 252. Twitter followers 1,163. Facebook fans 37,447. Twitter followers 7,565. Mumbai, India About Blog My name is Magali & welcome to my eponymous blog. I post about beauty, personal style, my travels, tech, food & other lifestyle content. Facebook fans 40,038. Twitter followers 11,611. Facebook fans 354,668. Twitter followers 9,054. Bengaluru, India About Blog I am a hopeless romantic, legally(yeah) blond(not really), daydreamer, poetry lover, confident and comfortable in my size, sensitive human. This blog is about being yourself, fearlessly, not being afraid to show what you are. A fashion & lifestyle blog, talks about the latest vogue in dresses or make-up. Food for thought & latest events in Bangalore. Facebook fans 52,738. Twitter followers 145. Facebook fans 26,241. Twitter followers 3,897. Mumbai, India About Blog Fashiontourist.co brings you snazziest info and coolest updates from the world of Fashion, Beauty, Lifestyle and Travel. Facebook fans 6,255. Twitter followers 13,464. INDIA About Blog MANJULIKA PRAMOD - I TRAVEL NEAR AND FAR FOR INTERESTING PERSPECTIVES! Read, Eat, Travel, Indulge and Blog! Most importantly, just follow your heart. Facebook fans 1,384. Twitter followers 9,517. Greater Noida, India About Blog The Pink Velvet Blog is a Beauty and Lifestyle Blog by Niharika Verma covering Skincare, Makeup, Food and Lifestyle Product Reviews, New Brand Launch, New Product Launch, Restaurant and Cafe Reviews and Blogger Events. Facebook fans 1,407. Twitter followers 810. Mumbai, India About Blog I founded my blog on a whim back in 2010 as an outlet for my fashion hedonism and now it's become a huge part of my life, something I work on daily to document my daily style, an outlet for my editorial creativity and simply, my love for all things sartorial. Facebook fans n/a. Twitter followers 15,223. New Delhi, India About Blog See what is trending in the news all over the world. Catch up on top trending stories and stories. New viral and trending content is published every day curated just for you. Facebook fans 63. Twitter followers 41. India About Blog The Small Town Blogger is a mirror image of my Personal Lifestyle. I always find ways to delight my viewers and readers with different and good content. The Small Town Blogger is a space where irrespective of your appearance and size, I will help you enjoy fashion like never before. Facebook fans 2,952. Twitter followers 433. About Blog Hi, My name is Purnima Madaan and I am a blogger, a professional content writer, a self-made digipreneur, a professionally trained makeup artist, a stylist and a big time movie buff. OOTDiva stands for Outfit Of The Diva and it is my approach and initiative on fashion, style and health. It is everything that I know, learn and feel about the three niches mentioned above and products and services that help me live through the boredom of life. Facebook fans 4,118. Twitter followers n/a. ATL About Blog Sharing information for health, food, traveling, fashion, insurance.and lifestyle facts. Facebook fans 617. Twitter followers 4,245. Noida, India About Blog MEMYSHA covers the real information that young girls and beautiful ladies want to know about - fashion, lifestyle, beauty, relationship, culture and health. Facebook fans 371. Twitter followers 5. About Blog Welcome to my official blog, this page is all about my blogs on fashion ,travel,relationships,health etc, come and be a part of it. New Delhi About Blog Welcome to ChicLifeByte for daily bits of fashion, lifestyle, beauty & food. CHIC means fashion- the hot & happening; LIFE means getting your life spruced up & getting a life with upcoming fashion & making a style statement bang on with me covering all the latest fashion and style news with the filmy gossip bringing you the latest fashion from the glamour world & BYTE means all the delicious, hot, tempting, innovative and new that we serve you through our blog. Facebook fans 21,518. Twitter followers 3,337. Facebook fans 5,483. Twitter followers 1,997. New Delhi About Blog Tashiara is a fashion, style and blog for young girls, boys and women who believe that fashion runs in their bloodstream. It's your personal guide to stay updated about the latest fashion trends, styles, ideas, tips, DIYs, how-tos and much more. Facebook fans 3,038. Twitter followers 688. Kerala, India About Blog Articles, reviews, stories, poetry and more. The array of thoughts channeled into a mold of words to let the readers feel the surge of satisfaction. Facebook fans 2,211. Twitter followers 972. Facebook fans 2,791. Twitter followers 3,529. Mumbai, India About Blog If you're looking for style inspiration, latest fashion trends, beauty tips & tricks, lifestyle and some exciting travel experiences, we've got you covered. Facebook fans 1,931. Twitter followers 18. India About Blog Get latest tech updates, news,tips of online earning, Fashion,reviews on mobiles and other gadgets in Hindi. Also find the best app for andriod. Facebook fans 3,305. Twitter followers 6,721. Facebook fans 1,368. Twitter followers 1,783. India About Blog India's no.1 lifestyle and entertainment magazine and your daily dose of films and fashion. Get latest bollywood news, film awards, celebrity updates, latest hindi movie releases and reviews only at Filmfare. Find celeb gossip, fashion with exclusive stories and pictures. Facebook fans 4,577,016. Twitter followers 4,306,285. Facebook fans 11,514. Twitter followers 1,801. About Blog The Blog about Personal Style, Travel, Fashion and Lifestyle by Personal Fashion & Lifestyle Blogger Riya Jain. Facebook fans 6,252. Twitter followers 4,055. Bangalore/Delhi-Gurgaon About Blog Sartorial Secrets aims to discuss fashion & beauty from every perspective, to translate trends from the runway to the sidewalk and to be the go-to destination for everyone who wants to add a bit of fashion & colour to their lives. Facebook fans 7,214. Twitter followers 2,106. Facebook fans 3,792. Twitter followers 898. India About Blog A Traveler by passion and an Infrastructure Consultant by profession. 'My Unfinished Life' is an expression of my love for life as I experience it. Facebook fans 37. Twitter followers 1,476. Bengaluru, Karnataka, India About Blog This blog is a reflection of who I am and my lifestyle and everything in between. All opinions expressed are mine and in no way represent the places or people I review. Facebook fans 10,949. Twitter followers 2,808. 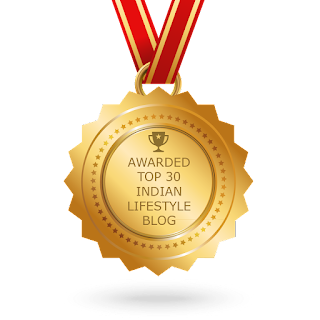 CONGRATULATIONS to every blogger that has made this Top Indian Lifestyle Blogs list! This is the most comprehensive list of best Indian Lifestyle blogs on the internet and I’m honoured to have you as part of this! I personally give you a high-five and want to thank you for your contribution to this world.